The exhibition YIBANEH! Jewish Identity in Contemporary Architecture opened in Amsterdam a fortnight ago. The title (Hebrew for ‘it will be built’) refers to the numerous Jewish institutions built in recent years, from the late twentieth century till the present day. The subtitle refers to identity, a concept whose meaning is not easy to pinpoint. Which architects did the governors of Jewish institutions select in their quest to represent their identity through architecture? This very effectively designed exhibition features 16 well-documented projects. We have Libeskind, of course, with his emotional muscle-flexing in the Jewish Museum in Berlin and a less well-known museum in San Francisco. Gehry, the unrivalled guru of branding, is there too with a remarkable project for a Museum of Tolerance in Jerusalem (it’s a sad sign when the last resort for tolerance is inside a museum). Israeli architect Zvi Hecker is represented with two projects: a Jewish community centre in Duisburg and an exuberant school in Berlin. Also on display are Mario Botta’s synagogue in Tel Aviv, Moshe Safdie’s Yad Vashem Holocaust Museum in Jerusalem, two minimalist designed schools in Vienna by Adolf Krischanitz, and a school in Haifa by Al Mansfeld. How is Jewish identity represented in these very different projects? Libeskind, in his introduction to his design for San Francisco, refers to the literal relationship with the Hebrew letters ‘ח (Chai = life). Hebrew is the mother tongue of the present writer, but I was unable to decipher these letters in the plans or sections. 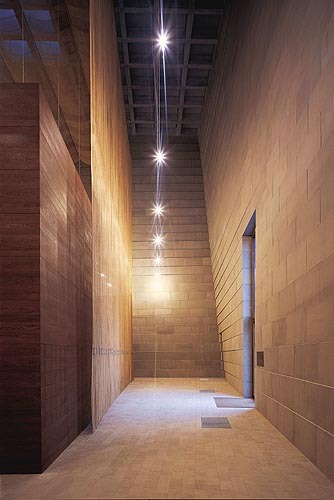 Libeskind’s ‘narrative’ was evidently sufficient for a client whose religion prohibits images. 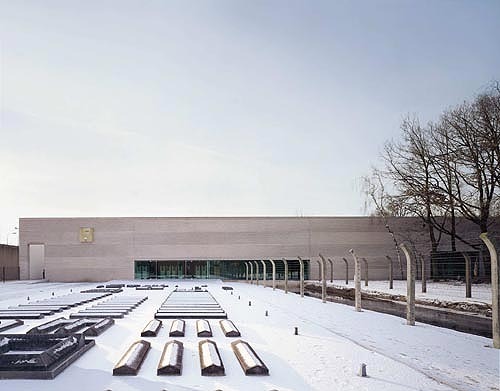 Hecker divides his Duisburg community centre into seven segments that, he says, correspond to the seven periods in the history of Jews in Germany. Ralph Appelbaum positions six free-standing columns in front of the Holocaust Museum in Houston as a literal reference to the six million Jews killed during World War II. Most of the other designers deploy universal architectural means such as light, mass and composition to give particular character to their buildings. After all, explicitly Jewish elements do not exist in architecture. Notwithstanding that, one architecture firm manages to refer directly to Jewish building history – and with success. The prayer space of the synagogue in Dresden – designed by Wandel Hoefer Lorch + Hirsch and the worthy recipient of many architecture awards – is enclosed by a curtain of woven copper wire. This is a reference to the first structure of Judaism: the tented Tabernacle. The result is a magical play of light, transparency and colour. With a Jewish Centre in Munich, the same architects unwittingly illustrate just how limited the frame of reference is for Jewish architecture: they repeat the reference with almost the same material. Only one Dutch building – not commissioned by a Jewish organisation – features in the exhibition: the Museum for Kamp Vught National Monument designed by Claus en Kaan. That comes as a surprise given the international admiration for current Dutch architecture. But it’s the only building that dates from the period covered by the exhibition (1990-2003). Some years earlier the Jewish Historical Museum in Amsterdam held a limited competition for a future extension. But it is uncertain whether the winning design by UN Studio will ever be built. The ambitions of Jewish institutions in the Netherlands have lagged well behind those of comparable institutions in the United States and central Europe in recent years. In the architectural history of the twentieth century Jewish architects have, by contrast, played an important and often decisive role: Mendelson, Kahn, Stern, Eisenman, Libeskind, Gehry and others too numerous to mention in this short review. The centre of Tel Aviv boasts the largest and best surviving collection of building in the Bauhaus style anywhere, though that has little to do with the Jewish background of these architects. The exhibition compilers chose to focus on ‘Jewish identity’ in architecture. They did not simply limit their selection to work Jewish architects but instead chose buildings commissioned by Jewish organisations – synagogues, schools, and museums. Their focus was on the identity of the building clients, not that of the architects, never mind the ‘architecture’. Representing the identity of the client – i.e. branding – is a topical subject in architecture at present. By commissioning spectacular architecture that generates publicity, clients hope to strengthen the position of their organisations within the web of social, political and cultural interests and, last but not least, to boost visitor numbers. The exhibition compilers speak in this regard of a ‘new Jewish self-awareness’ and of a ‘growing sense of Jewish identity’. But it would seem more accurate, I think, to interpret the exhibited projects in the context of the wider and increasing tendency to interpret architecture as a communicator of identity, and Jewish identity in this case. The first architect mentioned by name in the history books – as we learn in architecture classes – is Daedalus. He it was who designed the labyrinth for King Minos in Crete (1700-1400 BC). Yet there is another candidate: Bezalel Ben Uri. He designed and built the Tabernacle (1500-1400 BC), a portable structure for the exodus of the Children of Israel through the desert from Egypt to the Promised Land – the precursor, in other words, to the first Temple. The description of his accomplishments covers no fewer than five chapters in the Book of Exodus in the Old Testament. The architecture of Judaism, therefore, is founded on one of the oldest building traditions in the world. Yet it has never amounted to anything like a recognisable architectural school. Unlike the position accorded to the architecture of Islam or Catholicism in the history of architecture, the position of Jewish architecture has remained surprisingly modest. Catalogue: Angeli Sachs and Edward van Voolen (compilers), Jewish Identity in Contemporary Architecture, Prestel Publishers, Munich 2004, 176 pages, German/English, € 59,- ISBN 3-7913-6014-0, paperback or 3-7912-3057-8 (hardcover).